I am on the platform at Stevenage railway station waiting for Alison and the train to Leeds. It's a lovely sunny start, you can see why May is the national walking month. Today is the Launch of our first Pilates and Walking holidays in the Dales. Alison and I from the office are going to join this first experience. Join us as with tell our story day by day; or why not book the experience for yourself as there are future experiential dates available. 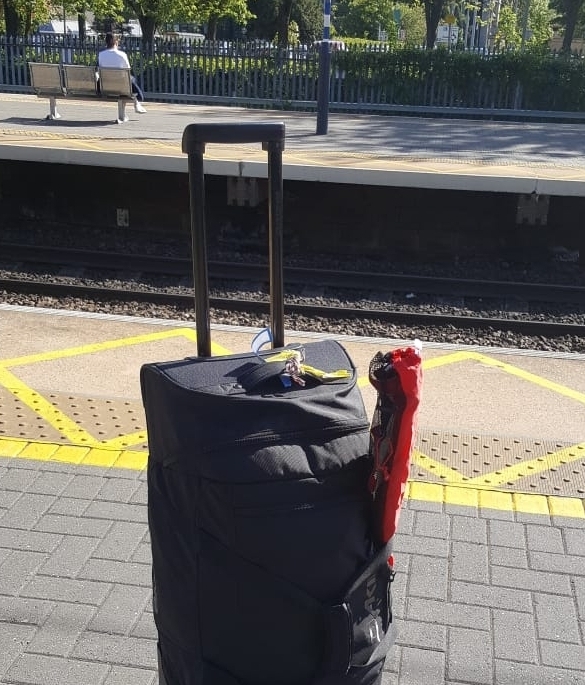 My bag with the essential walking poles. A little bit about us. Well, we both like walking. Alison goes walking every day with her dog and at lunch times around the lovely countryside where our head office is based in Lemsford, Hertfordshire. We both love the mountains summer and winter when walking turns to skiing. Alison loves Andorra for it's easy access to runs and the incredible views. I'm still recovering from the incredible views I experienced in Wengen last summer Wow! For both of us this is our first visit to the Yorkshire Dales. 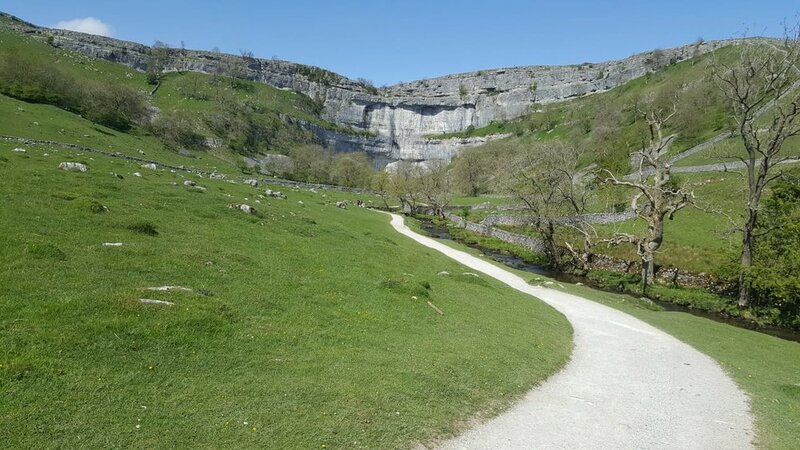 We are looking forward to the wonders of places such as celebrated Malham Cove, Gordale Scar and Wharfedale. On Virgin train now to Leeds and time to catch up on what we can expect from this experiential holiday. Just had our tickets checked ...."ta love" that lovely accent adds to our excitement. We are going up north very fast! 12.16. 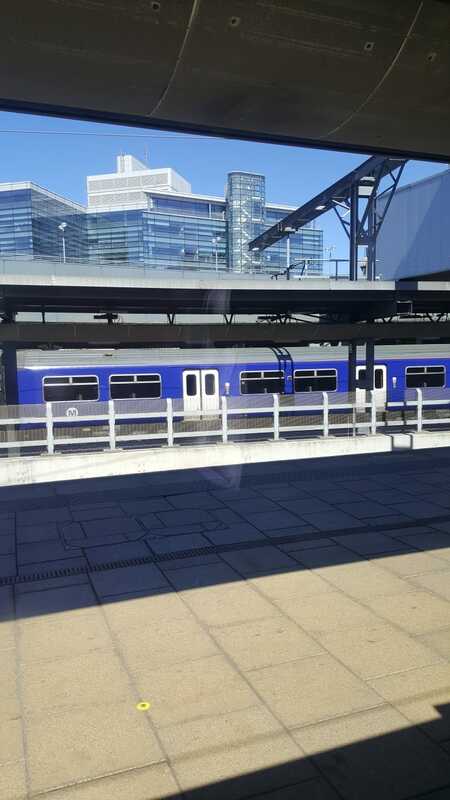 Leaving Leeds station en route to Skipton our base for the next few days on a slow train. What a sunny day. One of the stops was Saltaire a World Heritage site. 13.37. We arrive at the end of the line and Skipton station and step back in time. A short taxi ride and we arrive at our hotel the Rendezvous. We waited on the bar terrace (above) before meeting our Leader and Pilates instructor Debbie and the rest of the group in the lounge. 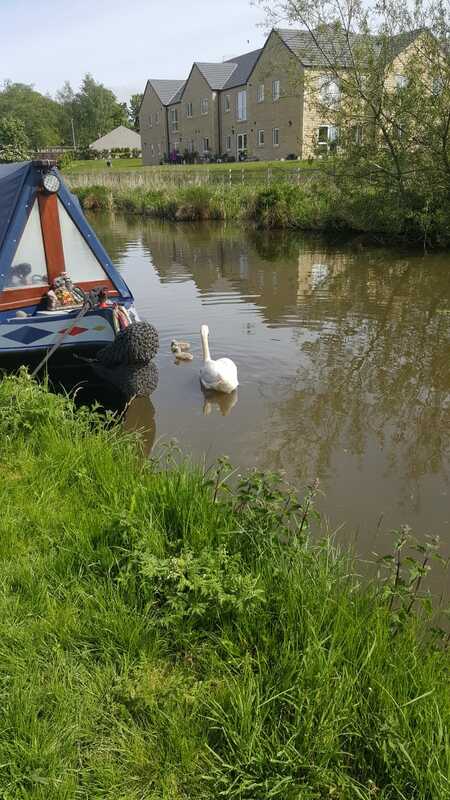 The Rendezvous hotel is on the outskirts of Skipton located by the Leeds and Liverpool Canal. 5.00 we changed into appropriate clothing for our first Pilates session held in the Winterburn Suite. Before hand Debbie explained where we will be walking over the next few days, safety rules etc. Debbie presented us with our own mat and block that we have to look after for the duration of the holiday. The group was a mix of those who have done Pilates before and complete newbies like Alison. Debbie asked if we had any injuries or concerns and introduced the principals behind Pilates and the exercises. We then started with getting to know our core. She was impressed by our balance and fitness levels. Then it was back to our hotel room for a quick change and dinner held in the Baby Swan Restaurant. One of the group members had a great way of helping us get to know each other by trying to remember every ones names and of course the great ice-breaker was laughing at our first attempts of Pilates. We enjoyed a 3 course dinner whilst pianist played in the back ground. We all retired to the lounge for coffee and a chat before going to bed. Good morning ... It's day 2 and time for a hearty breakfast - full English or continental. The hotel has a fitness centre with swimming pool so some of the group started their day with a swim, sauna, steam or spa before breakfast. A mini bus collects us at 09.15 and takes us to the National Park car park at Grassington the starting and finishing point for walk. 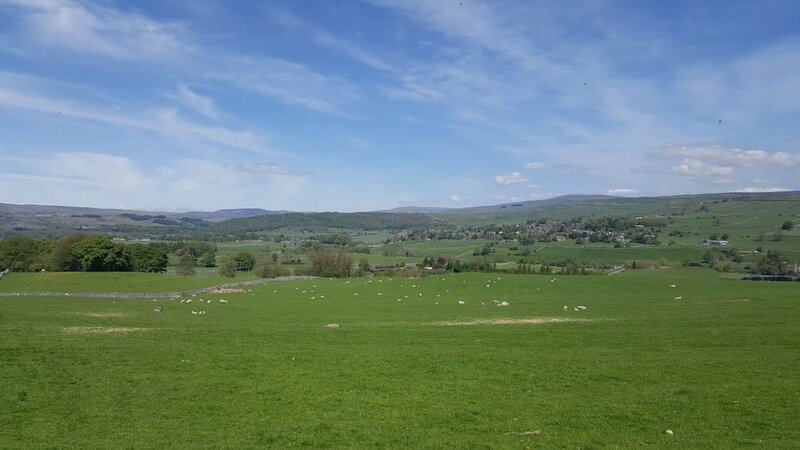 The walk crosses the River Wharfe twice to explore both sides of the dale, taking in the historic and quaint villages of Linton, Thorpe and Hebden. Popular spot for canoeists and sadly many tragedies too due to the strong current. Debbie telling us about the cotton mills and that now they work with silk. Here we are with our leader Debbie stopping for a much needed loo stop in Linton. Don't forget to carry a 20 pence piece. 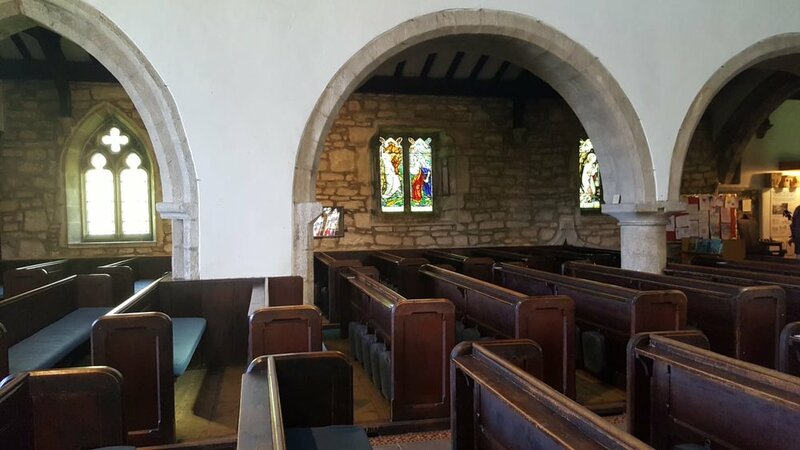 It is estimated that over 10,000 bodies have been buried in Linton Church yard since Norman times. From this point we could see three very different bridges in front and behind where we were standing illustrating Three Ages of Bridges. It was also supposed to be here that Miss February from the Calendar Girls was photographed. Surrounded by our very Green and Pleasant Land and silence with the highest point Simon's Seat in the distance. 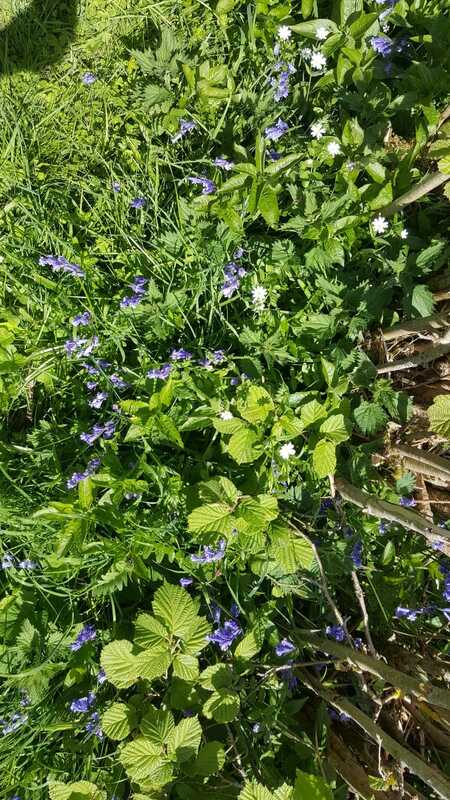 Bright blue Blue Bells lined the ancient hedgerows. Over a very bouncy suspension bridge to a shady area on the river bank for a lunch stop. Debbie kept asking if we wanted to stop along the way but we were such an energetic group that we wanted to keep walking. We felt sorry for Debbie and decided to give in as she was absolutely starving. At this point we checked our pedometers etc and established that we had walked over 6 miles. 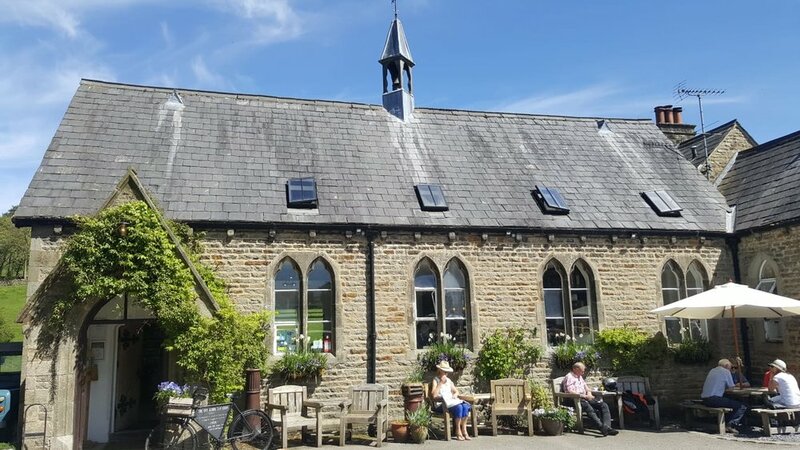 After a further 3 miles we arrived in Hebden and just had to stop for afternoon tea at a converted school. Debbie recommended the home made cakes in particular her favourite -coffee and walnut. Oh dear there wasn't any coffee and walnut left however, they did have a delicious elder flower and lemon drizzle cake in honour of the Royal Wedding. 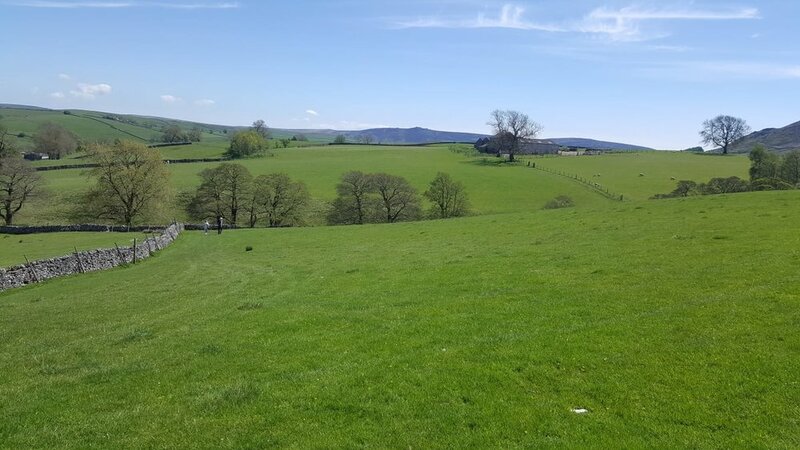 We could see Grassington in the distance and the end of our first day of walking and getting to know our new friends. We made it - 10 wonderful green miles! The mini bus took us back to our hotel. We had time for a quick refresh before our Pilates class. Wow did we need that to stretch our legs and relieve our shoulders after carrying our day sacks. Followed by a much needed 5 minute Zen moment to relax the mind. Refreshed and toned we were ready for the next activity... to meet up in the bar before dinner to taste the local ale and rhubarb gin. Eating 3 courses with excellent company was so enjoyable. After a full day we all drifted to bed for a well deserved rest. Some of us were meeting for a swim at 7am. 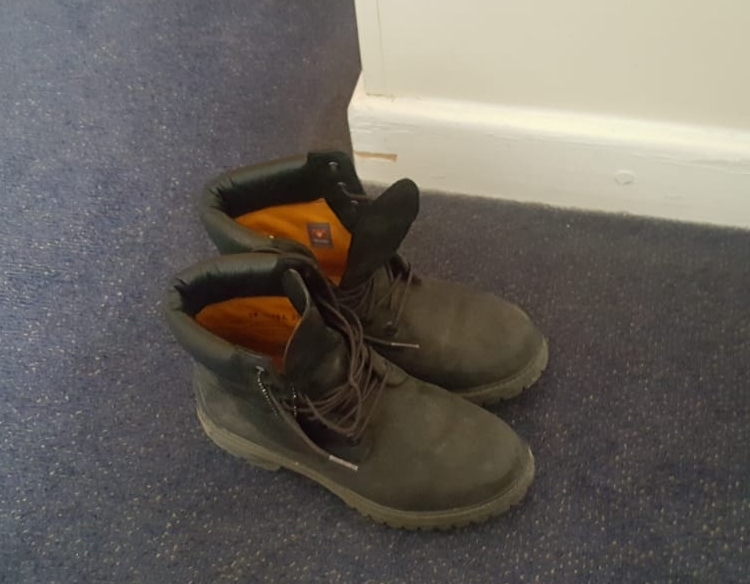 "Morning boots, let's see where we are walking today". Just had a hearty Yorkshire breakfast so ready for our next adventure... and in search of the Peregrine Falcons. 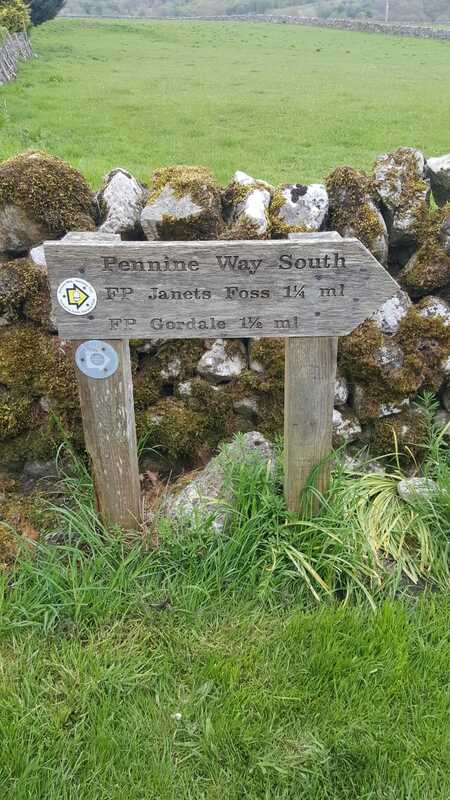 On our way along Pennine Way to magical Janet's Foss. The boys followed tradition by placing a coin in a tree trunk. Here we are at Gordale Scar fascinated by the waterfalls and geology this is a good place to stop for a lunchette. Made it to the top! Wow what a view... just a bit higher to the very top and need your poles for this bit especially as it is windy. Just managed to weave our way down a slippery lime stone path to Malham Cove. Debbie reminded us to think of our core Pilates exercise to help with our stability. Friends and new friends having fun about to tackle the spectacular and bizarre limestone plateau formed in the last ice age and down to Malham Cove. We did catch a glimpse of a nesting Peregrine high up in the cove. As we walked through the fields away from the cove to Malham the sun was out and all you could hear was silence interrupted by a bah and water gently flowing. We walked through pretty Malham village with time to browse but we were ready for our lift back to the hotel. We estimated that we walked 7 miles but there were more descents and ascents today. For Alison and I this was our last day with the group and the Dales. It was quite sad to leave them has spent time getting to know them and sharing such unspoilt spectacular scenery. Followed by a relaxing Pilates session and evening meal. 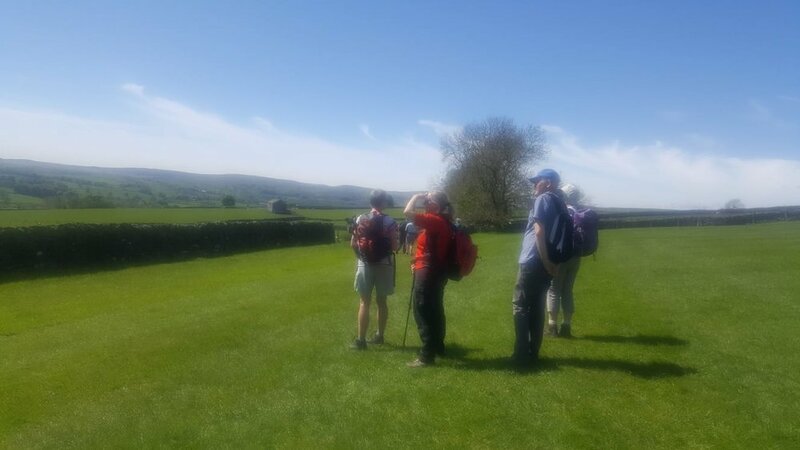 After saying our farewells after breakfast Alison and I walked into Skipton along the Canal tow path and swapped memories of wild orchids, Pilates and how much we enjoyed this new experiential walking holiday and enjoyed meeting such a lovely group. We hope our paths meet in the future. Slightly apprehensive before meeting on Day Zero. Am I the only novice? Will there be others on their own? In this group of 15 walkers gathered in Skipton, I’m relieved to discover another newbie to rambling and some other singletons.